This young man proved more resourceful in all of Igbos post-civil war demand for fair inclusion in the Nigerian government. He had the highest followers and commanded the greatest respect from the Igbo youths more than Azikiwe, Chuba Okadigbo, Sam Mbakwe, Alex Ekwueme put together. Second only to Ojukwu. Nnamdi Kanu seemed to understand the language of the Nigerian government when it comes to the best way to draw its attention. For the few months he had the freedom to lead his followers, he achieved unprecedented results and made unimaginable impacts. Until his own brothers, betrayed him like Judas. That the Nigerian government ever spoke of Restructuring was courtesy of Nnamdi Kanu. But the Igbos, particularly the subservient south east governors and the so-called Ohanaeze Ndi Igbo felt they would be pushed to the left side of history if they allowed ‘a nobody’ lead and achieve the long Igbo dream. Hence the treachery that led to Nnamdi Kanu’s disappearance or death; who knows? And the saddest is the silence of his own brothers (the Igbos) towards it. I can’t write to condemn the federal government whose efforts had been to crush Nnamdi Kanu from time but to damn the Igbo race for always proving to be the greatest threat to their own progress as a people. Nnia Nwodo came out to say that Nnamdi Kanu’s approach was too rash and childish, and would achieve no results. Now, he goes about making most beautiful speeches to a bunch of ethnic bigots who commend him by sitting at the back, laughing and pressing their phones and mocking him, knowing that he is merely pouring libations on a dead rock. It would always end in the Yeas! and Nays! And the number is always theirs. Nnia Nwodo erroneously believes that such beautiful speeches, laden with fine grammar would have any effect in a Nigerian system being driven by people who have no knowledge of even the simplest rules of grammar. Such a nightmare! Only Nnamdi Kanu understood that the current Nigerian Structure would never guarantee Igbos their due entitlements in the Nigerian polity; with only one geopolitical zone out of 6, 5 States out of 36, 15 senatorial slots out of 109, and 43 seats out of 360 federal constituencies! Tell me, what bill can the Igbo's sponsor and win independently in the current Nigerian setting? Now IPOB remains a disbanded group of idlers, a ‘terrorist’ group, just like the government purposely baptized them to cripple them. Even when they never harmed anyone. No one speaks for the reversal of this hateful proclamation by the Buhari led government. Herdsmen are there, killing innocent people in hundreds. They’re not terrorists. Shites are there. They’re not terrorists. MEND is there. They’re not terrorists. Ijaw Youths Council is there. They’re not terrorists. Northern Youths Forum is there. They’re not terrorists. Yet the said Ohanaeze Ndi Igbo led by Nnia Nwodo cannot even sustain the Restructuring which came up through Nnamdi Kanu and his IPOB’S movement. Nobody hears the government or even the APC speak of Restructuring anymore. Of course, their threat had been eliminated; Nnamdi Kanu is no more. The remnants are barking dogs that would never bite. And to make the whole thing more laughable, I heard that Ohanaeze is organizing a conference on Restructuring. And one wonders, is it the Ohanaeze that they seek to restructure or what? Who would accent to their resolutions? Perhaps, it’s another plot to achieve their selfish goals, as they’ve been doing all along? Here’s the conclusion of the matter: we Igbos must demand the release of Nnamdi Kanu by the federal government. He represents the new and most potent Igbo front to actualize and guarantee our stake and demand for fair share as one equal out of the three ethnic components of Nigeria. And if he is dead as every evidence points, then we will have to wait another century for another of his kind to be born. 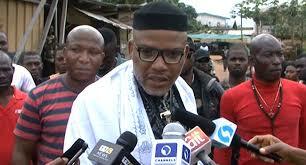 Forgetting Kanu means throwing a hundred years behind, our quest for self-determination as Ndi Igbo. Nnamdi Kanu must be found. He must not be forgotten like a dead chicken. At least, Igbos (his own brothers) should not. Until then, the Ndi Igbo remains a defeated race, shamefully complicit in their own annihilation agenda.